The Nikon AF-S DX Zoom-NIKKOR 17-55mm f/2.8G IF-ED is a pro grade fast standard zoom designed for APS-C cameras. Thanks to a constant f/2.8 aperture this lens is able to shoot in low light and provide shallow depth of field. 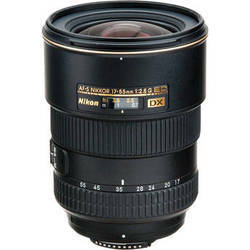 Overall the Nikon AF-S DX Zoom-NIKKOR 17-55mm f/2.8G IF-ED reviews well with users online, scoring 4.79 stars (out of 5) based on 652 reviews. It just barely misses my threshold for “Highly Recommend” (4.8 stars). If Nikon were to cut the price of the lens to around $1000 I believe that reviews would bump up to around 4.85 stars. The lens is a bit on the expensive side, especially when you consider the Canon 17-55mm f/2.8 sells for significantly less money. The Nikon features a better build quality, but the Canon has Image Stabilization. I have not formally tested this lens, but I have played with it and while the image quality was very good, I just did not feel like the value was there. I usually recommend the Tamron and Sigma fast standard zooms over the Nikon AF-S DX Zoom-NIKKOR 17-55mm f/2.8G IF-ED. based on 652 user reviews online.